The Fairbanks metropolitan area has a population of around 100,000 people and is the largest in interior Alaska. After having left Seattle several weeks prior, it sure felt big to us, too! We ran a lot of errands here, but also had the chance to check out the fun things the area had to offer. Upon entrance to interior Alaska, we went from Chicken down to Tok – with some rough permafrost and intermittent gravel/pavement (it’s almost better when it’s just gravel!). We stopped at the Public Lands Information Center and local visitor center, as well as a few photo ops, and had a fantastically smooth drive with views of the Alaska Range the rest of the way to the rolling hill tundra around Fairbanks. We basically split our time between staying in the popular and spacious Walmart parking lot, and historic Pioneer Park – where you can pay $12/night to dry camp in the parking lot of this family-friendly park that also puts you in a good position to walk around town. There was potable water near the entrance to the lot (a little hard to find), we dumped for free and got propane at a local Sourdough Fuel, and got nice, hot showers at B&C Laundromat. One of the things that really stuck out to us on in the interior was that locals all had electrical plugs coming out of the front grill of their cars to keep them charged during the subzero winters. The Walmart literally had rows of electrical outlets lining the parking lot! We were in Fairbanks at its most hopping time of year – Summer Solstice. Around this time of year, Fairbanks gets nearly 24 hours of daylight, which means you have plenty of time to live it up and get outside. (Okay, technically, the sun sets around 12:30am, and rises again just before 3am, but it never gets close to dark.) I actually really liked the midnight sun but it did make a little hard to wind down at night. Luckily, the Walmart had these cheap and cute sleep masks! To celebrate the Solstice, we snagged tickets to the famous Midnight Sun Baseball Game, played annually by the Alaska Goldpanners at Growden Memorial Park at 10pm and with no need for artificial lighting. Here, you can see how dark – or not – it was at 10pm and then at game’s end around 12:30am. Game’s end at 12:30! No lights required! The Goldplanners sadly lost but put up a good fight and everyone was in great spirits the whole night, with local craft beers and plenty of summer fun to keep everyone cheering. We also stopped by the Midnight Sun Festival, where a couple hundred vendors and live performers set up shop downtown for the area’s biggest event of the year. From noon to midnight, the city lives it up to make the most of the midnight sun. It was a long-ish but pretty walk from Pioneer Park to here on the paved path along the Chena River. No, not THE North Pole, North Pole, Alaska is part of Fairbanks metro area, and unofficially celebrates Christmas year round. For years, people flocked here during the holidays just to get the North Pole postmark on their holiday cards and you can still get “Santa” to send your kids a personalized letter from here. Streets are lined with candy cane light poles and everything has a festive name, kind of like a few other theme towns we’ve come across. We didn’t notice a ton of actual holiday-related activity in June, but we did stop by the Santa Claus House. Not much more than a huge gift shop, it was still a fun little stop – even if we missed Santa that day. 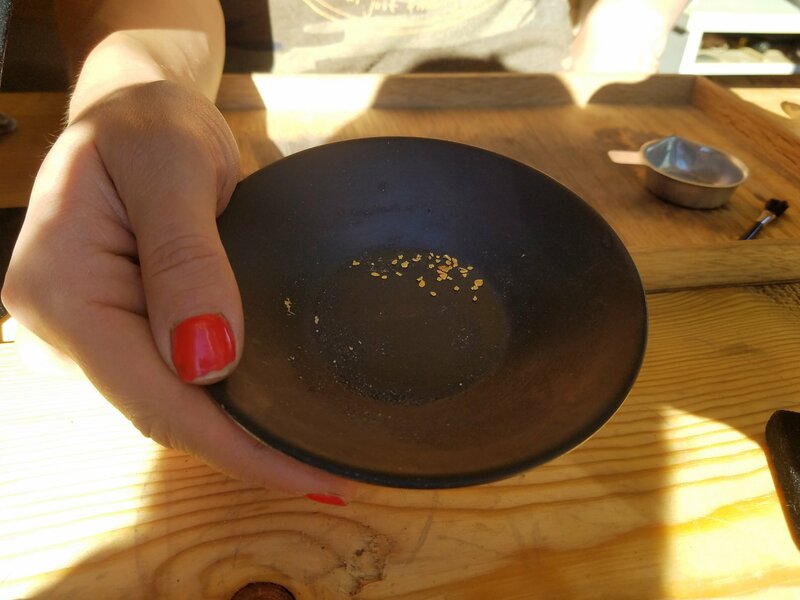 Pretty much all of developed Alaska took part in the gold rush at one point or another, but Fairbanks is particularly known for it. 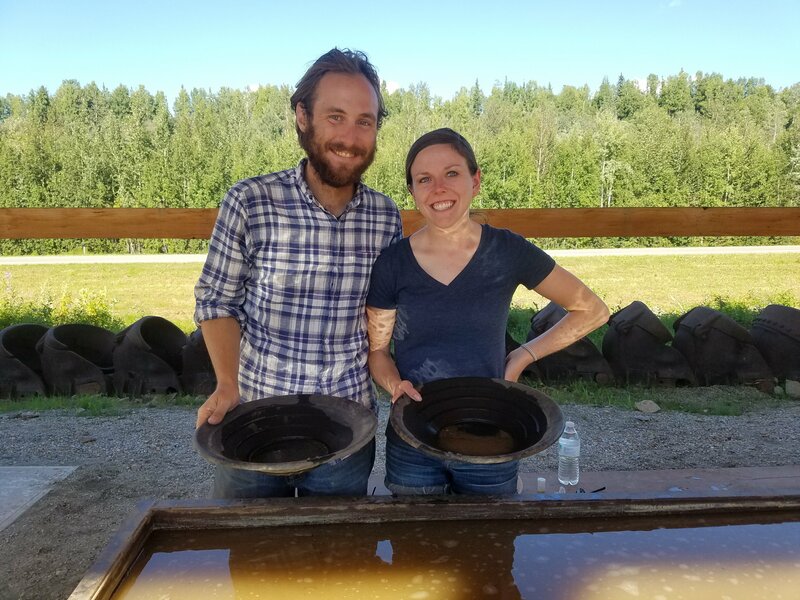 For $20/person, we tried our hand at gold panning at Gold Daughters, right after checking out an accessible part of the Trans-Alaska pipeline. All of Alaska seems to love Thai food as there are Thai food carts everywhere, but Fairbanks has a good number of quality sit-down restaurants. We liked Thai House but it seems hard to go wrong. We also dug the vibe of HooDoo Brewing Co. and its outdoor porch, where we had the opportunity to meet up with yet another one of John’s never-before-met cousins! College Coffeehouse had super yummy homemade chai’s and scones and the best wifi we’ve seen outside of Starbucks, maybe even better. We were bummed to find that there was no Costco in Fairbanks, but they did have several full-sized supermarkets, and we were delighted to find that Alaskan stores carry a bunch of Washington and Oregon products we like, such as Tillamook dairy products and local beers and wines. We were literally stocked with Tillamook Mudslide ice cream the whole summer – it was awesome! We definitely noticed an uptick in the price of non-Costco groceries but it wasn’t as bad as we were expecting and mostly on fruit. It was also convenient having a Ford dealer right next to the Walmart to get some things checked out on the truck. The Public Lands Information Center was also a helpful place for maps and general resources (they specialize in the Interior with vague, with overarching knowledge of the rest of the state). We’d also heard that the museum at University of Alaska Fairbanks as well as the Fountainhead Antique Auto Museum were supposed to be good, we just never got there. Fairbanks is basically Northern Lights viewing central in Alaska. Viewing starts to really see an uptick in conditions by September, but we just couldn’t stick around that long. We’ve heard March is a great time – though maybe not in an RV – for viewing and less frigid conditions. Be sure to check out our post on nearby Chena Recreation Area and Hot Springs to get the full feel for the Fairbanks area! We can’t wait to tell you more about it when we’re home! 🙂 And we’re kinding of missing that midnight sun!! As usual you guys have once again topped your previous experience with yet another wonder, the Midnight Sun. Always love hearing from you be it on line or by mail.